Today I found out that Samuel Clemens (aka, Mark Twain) used to “collect” girls between the ages of 10-16 years old. 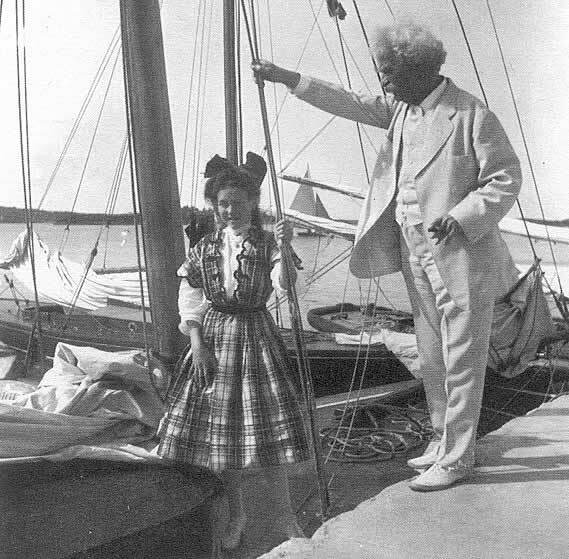 Okay, so it isn’t actually as creepy as it initially sounds and in some ways is kind of sweet, but Samuel Clemens did love to entertain young girls. Towards the end of Clemens’ life, he suffered quite a lot of hardship. His daughter, Susy, died in 1896 and his wife, Olivia, passed away in 1904, followed by a second daughter, Jean, in 1909. Clemens fell into a depression in the early 1900s and noted that while he had reached the grandfather stage of life, he had no grandchildren to keep him company. He therefore went about befriending young girls who he treated as surrogate granddaughters. The girls in question were the daughters of couples who ran in his same social circle. He often met them on boats carting him back and forth to England or Bermuda, as was the case with Helen Allen. Allen was just twelve years old when Clemens stayed with her family in Bermuda. Her father was the American Vice-Council in Bermuda; her grandmother had known Clemens’ wife as a child. Clemens said Allen was “perfect in character, lovely in disposition, and a captivator at sight”- everything that Clemens wanted in his collection of young girls. The group of girls were called “Angel Fish” or “the Aquarium Club.” The name is derived from the fish that Clemens first saw in Bermuda. He decided on that name because the angelfish “is the most beautiful fish that swims.” Clemens would buy angelfish pins in Bermuda and present them to each of his girls. Out of a dozen or so original pins, at least one is still in existence. It currently resides in the Mark Twain Library in Redding, Connecticut. So what exactly did a man in his late seventies do with a bunch of teenaged girls? All manner of innocent, grandfatherly things. Clemens invited the girls to concerts, the theatre, and to his own house for card games, billiards, and reading. While in Bermuda, several of his Angel Fish had fun riding in a donkey-pulled cart with him. Clemens initially called his estate “Innocence at Home” in honour of “his girls.” He kept in touch with them by exchanging letters when they couldn’t visit, but always kept a room available and hoped to have an Angel Fish “in it as often as Providence will permit.” Before you get too much of a “Michael Jackson” vibe, it should be noted that the girls were always accompanied by a chaperone; the room for the Angel Fish even had two beds to accommodate a mother or guardian along with a girl. Besides the room, Clemens’ house also had a billiard room which was refashioned into a sort of shrine to the Angel Fish. Above the door was a sign that said “the Aquarium” and inside the walls were lined with framed photos of each of the Aquarium Club’s members. Despite this, only one relationship ever looked to be somewhat improper, and that wasn’t with one of his Angel Fish; further, the inappropriate overtures didn’t come from Clemens. The girl was Gertrude Natkin. He met her when she was 15 and he was 70 in 1905. The two exchanged letters and Natkin developed a “school girl crush” on Clemens and went somewhat overboard in expressing her affection for him through her letters. Clemens became concerned about this and distanced himself from her- his letters growing more and more infrequent, because he didn’t want to gain a reputation for impropriety nor encourage her affections, perhaps proving that he saw his Angel Fish as nothing more than granddaughters. Certainly, at the time, an adult male courting a 15 year old girl wouldn’t have raised eyebrows, particularly if the suitor was well-to-do and not too old. But at 70, it would have been a scandal even in that time period. Clemens died on April 21, 1910 of a heart attack, just a few years after establishing the Aquarium Club for his Angel Fish. All in all, there were around a dozen members of the club who visited Clemens regularly until his death, but his enthusiasm for the club waned in the last year of his life; he complained that his girls were growing up too fast, complained about their boyfriends, and cut off one girl when she turned sixteen. In the end, his fondness for them primarily lying in their innocence, as something of a breath of fresh air in a cynical world, waned as they gradually lost that defining feature of children. Twains love of innocence and apparent adoration of little girls in a parent or grandfatherly sense, is somewhat mirrored in another famous writer, Charles Dodgson (Lewis Carroll), who used to take a few little girls out for day trips to play games and tell stories to them. 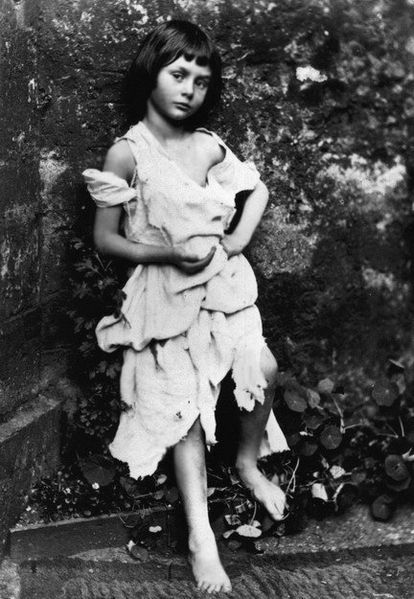 One of the little girls was Alice Liddell, who helped inspire “Alice’s Adventures Under Ground” which became “Alice’s Adventures in Wonderland”. She begged him to write the story down for her that he’d come up with while they were adventuring, and the result was his most celebrated work. Samuel Clemens was born in 1835, a year in which Halley’s Comet could be seen. He once predicted that he’d die in a Halley’s Comet year, and he did—just one day after the comet could be seen from Earth in 1910. Clemens also associated with other women. He was a fan of several actresses who he thought showed a lot of promise and regularly corresponded with another group called “The Juggernaut Club,” made up entirely of adult women who exchanged letters with Clemens. Among Clemens’ regular correspondents was Ethel Barrymore, an actress and great-aunt of Drew Barrymore. Clara Clemens inherited her father’s entire estate upon his death, receiving quarterly payments which he hoped would keep the estate out of the hands of any men in her life. Clemens became a grandfather to a real granddaughter several months after his death. Her name was Nina, and she died in 1966 after ingesting a lethal cocktail of alcohol and medication. As Nina left no children behind, Clemens has no direct descendants alive today.